Doug and I went to see "Marley and Me" this afternoon!! Yep, we loved it.... laughed and cried! Yes, the book is always better but they did a great job bringing Marley to life! This little sweetie, Lucy Merriam, played their daughter in the movie. She plays Emma Lavery on All My Children. I don't usually make resolutions. 'Cuz I break them. But this year? I need to make some changes and I want to commit to keeping them. These last couple of months have been particularly difficult for me. Low energy, lack of being able to follow thru on a personal level, easily overwhelmed! lol. You name it and that has been me! So it has gotten me thinking and 2 important things come to mind and thus my resolutions. 1. 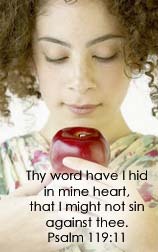 Personal/spiritual - Faithfullness in reading my devotions and conversing with God DAILY. Yeah, I am a person who "prays all the time". But it isn't always that personal ALONE time just with God. A designated time. Not just when I am driving down the road or doing the dishes, etc. But, I have fallen short on making that special time, alone, just God and me and reading His Word and praying. So - resolution. A special time daily - same time each day, Me, God, my devotional, my cup of tea and the dining room table in quiet, no other disruptions around - EARLY in the day to start my day. I am excited to see what God has in store for me this year! I am going to be using a special daily devotional along with my Bible to Walk with God. 2. Personal - Home/surroundings - Getting my home organized and a home for everything! Taking everything in baby steps. As I said, I have low energy. I need to plan and execute this in a way I can achieve and succeed! So here is my plan. LISTS for everything!!!!!! LISTS LISTS LISTS. Cross off the list when done. Take each room and break it down to baby steps and make each baby step a line item! I will tackle a minimum of 3 line items a week (I work outside the home so trying to be realistic) and cross off as done. Goal? By the end of the year, my home will be completely organized and decluttered. Every item will have it's home and be there after use! I will try to share this journey with you as I go. And I am excited as Marcia, The Organised Queen has a plan on her website "The Organising Queen" that is going to fit right in with my resolution. Are you making any resolutions this year? Please share. 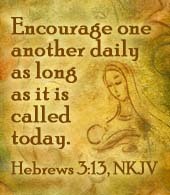 I would love to hear and love to encourage!! Outside my window...Darkness of morning, lights from across the valley, snow melting away.. I am thinking...of making an important resolution this year. I don't usually make them... something to break and not keep... this year needs to be different! I am thankful for...reconnecting with some old and dear friends this week in facebook! I am wearing... in my flannels, the house isn't warm yeat! I am hearing...the furnace kick on , the news softly on the TV and a helicopter going over. One of my favorite things...hearing my sweet granddaughter giggling! The simple womans daybook is not operating this week but I wanted to do mine anyway! You can still click the link and see older ones. Outside my window...Over a foot of accumulated snow - an absolute winter wonderland! I am thinking..... praying actually - a lot of people are out in this cold..praying for provisions and for the many many people stranded at the airport !! I am thankful for...my nice warm home! I am wearing...it is 6:30 and I am still in my flannel nightgown! I am going...to help Spot celebrate his 3rd birthday today! Our golden loves attention! I am hoping...... for all my family to stay safe and warm! I am hearing...the sound of the furnace starting up and blowing the heat thruout the house. Around the house...outside - LOTS of snow! One of my favorite things...The view from my front window! A few plans for the rest of the week: preparing the holiday meal. To see more Simple Woman's Daybook entries, click here. Still in the December Pacific Northwest Arctic Freeze! Night has fallen on our humble abode but the snow keeps falling and the cold is still here! Doug had just shoveled a good path in the driveway and the snow followed right behind him! Now they are saying this could be here to stay until the New Year! YIKES! Well, it is ony 2 inches now but it was/is enough to keep me from driving our hill! Always love snow if I don't have to drive in it. Spot is sitting under the tree watching the snow fall. Dark now and the snow is 3 inches... traffic a standstill south bound on 167 below us! Snow is slowing now I hope! I grew up on this version and the 1938 version. Both so very, very good. Heartwarming! Although this film does not come out and say the true meaning of Christmas is in Christ, it truly does share the spirit of Christmas This year as money is tight and the economy is struggling, don't forget the ones in need. As it is snowing out my window this morning, my heart turns to those that live on the streets. They need blankets and warm food. There are families losing their homes and without work this Christmas. I hope that as you prepare for your festivities, you will find the time to help teach your children that there are others with needs out there and help them to reach out and give as you can to others. It isn't about bikes, and toys, and Wiis and gifts. Christmas to me is about family and friends, about sharing the love of Christ thru the giving of money or gifts or food to others in need. Who can you think of that needs the gift of you this Christmas? The family down the street silently struggling with their finances? What about reaching out to the elder without family close by but a mind full of memories of Christmas' past. A single mom, a single dad, needing friendship and encouragement. perhaps an elderly person that has recently lost their spouse. It doesn't take much looking around to find someone in need. And it doesn't have to cost you your life savings. It just costs you some time and effort. Perhaps you yourself are struggling this Christmas. Consider this a special time to show your family that Christmas doesn't have to be about spending lots of money and getting lots of gifts. Think of creative and fun, simple ways to bring the spirit of Christmas into your home. You might be surprised just what a special blessing it is to all! Soft Sandwich Buns - Yum! I took a snow (mental health! lol) day today. I put my crockpot Chicken Sandwiches on and made these yummy hamburger/sandwich buns! This is from a Taste of Home magazine. They are so light and good. These rolls freeze well! TIME: Prep: 10 min. + rising Bake: 10 min. In bread machine pan, place the first seven ingredients in order suggested by manufacturer. Select dough setting (check dough after 5 minutes of mixing; add 1 to 2 tablespoons of water or flour if needed). When cycle is completed, turn dough onto a lightly floured surface and punch down. Divide dough in half. Roll each portion to 3/4-in. thickness; cut with a 2-1/2-in. biscuit cutter. Place on lightly greased baking sheets. Brush tops with melted butter. Cover and let rise in a warm place until doubled, about 1 hour. Bake at 350° for 10-15 minutes or until lightly browned. Yield: 1-1/2 dozen. Wordless Wednesday - Another view of windblown tree in our backyard! For more WW click here. Outside my window...C-c-c-c-c-cold and breezy, light dusting of snow left, a tree fallen in the back yard. I am thinking..... Oh..... How I would love to just stay cuddled up at home.... nice and toasty warm in the security of my home..... and then my heart turns to the homeless and I pray! I am going...to have to go to work but because of the ice I am going to be late..... I would rather be safe than sorry that way! One of my favorite things...the fresh virgin snow! For more Simple Woman's Daybooks click here. These are the Treats that my granddaughter and I made today. I am going to box them up and send to my out of town grands for a Christmas treat! I got the recipe from the TOH Recipe board. :) I used the crockpot to melt and blend the milk, caramel and butter. And I managed to drop all of my first 5 cups of Rice Krispies on the floor before I even began! Thankfully I had a big box and had enough to finish this project. Line two baking sheets with waxed paper; set aside. Place cereal in a shallow bowl. In a large saucepan, cook and stir the milk, caramels and butter over low heat until melted and smooth. Remove from the heat; stir in the cinnamon and vanilla. With a toothpick, dip each marshmallow into warm caramel mixture; turn to coat. Press marshmallow bottoms in cereal; place on prepared pans. Let stand until set. We haven't gotten much snow but the temps are cold and the wind is blowing making it much colder. Earlier Doug and I left to run to the grocery store. We along with my 13 year old granddaughter were thinking that Grammie's nachos fit the bill for dinner on a cold blustery day like today. We are only 2 miles from the store. We had to remove a tree from the road going to the store and coming home from the store. Cold brittle trees in this wind! When we got home, I was telling my granddaughter about them. She said "Well, Grammie, you got a tree down in the back yard!" Sure enough while we were gone this tree came down in our back yard. Startled her and the dog! Thankfully the tree only grazed the house and caused no damage! Growing up Christmas wasn't Christmas without watching the Andy Williams Christmas special. No one could sing this song with the reverance and emotion that he did! This is not an easy song to sing...A couple of modern artists have caught my attention with it though. Martina sings this song accapella and does a beautiful job with it. I sat down and watched this movie this afternoon with our Comcast on demand. What a wonderful WONDERFUL movie! It captures what being a youth should be about and it is just so heartwarming. And yes, I cried,and cried..... and cried some more. I loved it and am definitely getting this video to watch over and over with my grandchildren!!!! I hope you enjoy this! We used to watch this with the kids on movie nights often when they were younger! Miss those times!!!!!! So tell me, which is the area in your house that gets cluttered the quickest. Oh my! Mine is the table next to where I relax in the living room! There is really no excuse for it but it is where I congregate my reading, my crocheting, my tea, my... well, you get the idea! My battery is dead at the moment... I will get a new battery tomorrow and post a picture of it. For more decluttering journeys click here. Saturday, the Mountain was putting on a beautiful display of God's glory! The lenticular cloud was directly on top of the mountain, causing a top hat look. I was able to catch these pictures from my neighbor's front yard. For more Wordless Wednesdays click here and here. I am thankful for...the fact that God does not give me more than I can handle WITH Him and believe me ---- I need Him right now!!!! From the kitchen...nothing yet, but tonight will be hamburger and gravy with a creamed corn recipe that I found on another blog (not your canned creamed corn variation!!!) I am also going to try to make these caramel marshmallows this week for my grandchildren. This is NOT my picture. 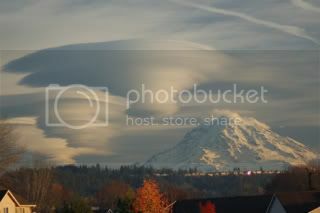 This is a freelance photographers (Tom Thompson) picture of Mount Rainier TODAY! This is EXACTLY what I was seeing as I drove home from work today! What a spectacular SPECTACULAR display of God's creation! Look at those clouds! I was spellbound. I had to call my daughter and tell her to look at the mountain if she was in a place where she could. She had just seen it too and was in awe as well! I hope you enjoy!! I am truly just mesmerized by this beauty!!! I am thinking..... I wish I didn't have to go to work today, I still need to stay home and take care of this icky that I got!!! I am thankful for...cozy warm blankets! Around the house...Christmas decorations are beginning to pop up! A few plans for the rest of the week: Work on my swap boxes!!! For more Simple Womans Daybook, click here!